Noonwraith is a Creature/Monster in The Witcher 3: Wild Hunt. 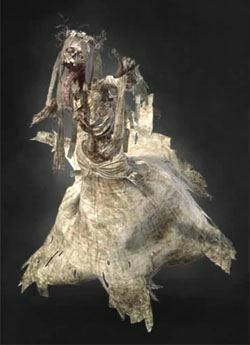 On particularly searing summer days, when the sun reaches its zenith, wraiths will at times appear, resembling sun-scorched women dressed in long, white robes. These are noonwraiths — the spirits of young women and girls who died violent deaths right before their weddings. Driven mad with pain or anger, they wander the fields searching for their unfaithful lovers or backstabbing rivals, though they will kill anyone who does not get out of their way in time. They are often held in this world by some object of intense emotional significance. That is why, if one ever finds a wedding ring or torn veil in the middle of a field, one should not pick it up, but instead back away as quickly as possible." Life-Drain: A cast-type spell that slowly drains stamina from the target. The Noonwraith will split into three identical entities, each must be hit just once (albeit quickly) to interrupt successfully. Quen: Good for avoiding quick attacks/knock-back. Never summon them at midday. Instead try dawn or dusk. Fight them within the bounds of Yrden to neutralize their invulnerability. Yrden magic trap is also very effective at damaging them. Aard and Igni are largely ineffective.